Sometimes there seem to be endless negative voices braying about the big, bad cruise lines and all the wrongs they do. But a quick investigation by The Cruise Examiner finds that this rump adds up to only two or three people, a senator, a university professor and a lawyer. In today’s lead story, we look at how that senator is trying to tax foreign-incorporated cruise lines trading from the United States, while in a follow-up story we look at the naysayers of the industry. Finally, we take a peek preview at two new ships now being built for AIDA Cruises of Germany by Japan’s Mitsubishi Heavy Industries. In filing a new bill last week that has the intention of taxing foreign-incorporated cruise lines that trade from and to US ports, Senator John D (Jay) Rockefeller IV of West Virginia made a case that lines should pay taxes as they benefit from the resources of the US Navy and US Coast Guard, as well as from the services of more than twenty US agencies and the infrastructure of ports and transportation. Rockefeller is the chair of the US Senate Committee on Commerce, Science & Transportation. Many of the largest cruise lines in the world are now headquartered in Miami, but incorporated overseas, meaning that they are not subject to US federal income tax because of an exemption in the tax code. This exemption was granted on the assumption that non-US corporations would pay tax on their international income in their home countries. Of the big three, for example, Carnival Corp & plc is incorporated in Panama, Royal Caribbean Cruises Ltd in Liberia and Norwegian Cruise Line Holdings in Bermuda. On Thursday, Rockefeller introduced a bill that would eliminate this income tax exemption for cruise lines and also impose a 5% excise tax on gross income if passengers embark or disembark in the US. The Rockefeller bill seeks to apply tax to cruise line income derived from cruises that embark or disembark passengers in the US. This income would be treated as subject to the US corporate income tax rate of 35%. In addition to charging income tax, Rockefeller proposes a 5% excise tax on cruise industry income, which would be used to fund transportation infrastructure. The bill would impose excise tax on gross income from cruises embarking or disembarking passengers in the US. For cruises where a majority of passengers embark or disembark in the US, the full gross income from that voyage would be subject to excise tax. 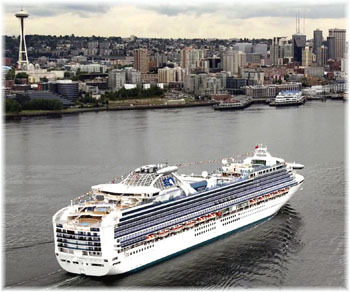 For cruises that call at a US port, but do not embark or disembark a majority of the passengers in the US, half of the gross income would be subject to excise tax. According to Senator Rockefeller, his excise tax would be similar to passenger taxes in the aviation industry and gas tax for motor vehicles. In a statement last week, Carnival Corp & PLC said that it pays nearly $1.2 billion to US federal, state and local agencies including port authority payments, government fees, dockage fees and payroll taxes. It also is subject to taxes and/or fees based on the guest counts, ship tonnage, ship capacity or some other measurement in “virtually all” port jurisdictions where its ships now call. The way the bill reads, not only would cruises operating to and from US ports be subject to the excise tax, but so would ship operators from around the world when their ships call in the US. With the devices of Homeland Security and the Cruise Vessel Security & Safety Act of 2010 (“the peepholes act”) having already prompted about half of visiting foreign cruise ships to drop their calls in the US in recent years, it is likely that the other half will now look at joining them if no way can be found of avoiding this new levy. After nearly thirty years in the Senate, Rockefeller is standing down from his seat and will not be running in the 2014 election. This will be none to soon for many, who regard Rockefeller’s recent efforts to give the US Department of Transportation oversight of the cruise lines as an unnecessary folly and a bureaucratic step too far. There’s no doubt about it. We’re already there. We’ve gone past the barrier and hardly anyone has noticed, but a cruise is no longer desirable for all the public. To many, the ships have now got too large and too impersonal. But luckily, the market has also grown so much that there is a larger choice of cruises available than ever. Admittedly, some cruisers do not like big ships, but plenty of alternatives still remain. Sadly, though, unlike in the past, some say they do not want to cruise again.. This first signs of pushback started when ships started getting bigger. The first 100,000-tonner was introduced seventeen years ago now when Lin Arison named the Carnival Destiny at Venice in 1996. And the Grand Princess followed in 1997. These first 100,000-tonners brought real economies of scale to cruising but were not yet that different from the modern cruise ships that had preceded them. Ironically, the Carnival Destiny has just been rebuilt as the Carnival Sunshine and Lin Arison, widow of the late Ted Arison, will once again perform the honours. It was really the arrival of the 1,000-footers that began to change the nature of cruising. The first, Royal Caribbean’s 1,020-foot Voyager of the Seas, of 1999, brought us a Royal Promenade, rock climbing walls and ice-skating. And in recent years, the trade has been deluged with bigger and bigger ships, culminating in 2009-10 in the 5,408-lower-berth Oasis and Allure of the Seas, which can carry 6,360 passengers when all beds are full. It is now also possible to go surfing on board and to be visited by Shrek, the appearance of whom has probably also scared a good number of adult cruisers away from these ships as well. Royal Caribbean now stand out as the builder of behemoths, giants and leviathans, now having produced ten ships in three different classes that carry more than 3,000 passengers since the Voyager of the Seas, plus planning three new ships of the Quantum class (4,180 passengers) and another Oasis. The interesting thing about these ships is that they are able to attract the custom, and they are able to do so at prices above the average. Norwegian Cruise Line, on the other hand, has added a lot of extras too, but with its Freestyle Cruising, started in 2001, it has also been able to charge extra for many if not most of its alternative restaurants. In fact, Norwegian is probably better known than most other lines as a line where you will pay end up paying more for on board spend than on some others. But while not all may like larger ships, the truth is that by the general public has welcomed these additional entertainment options and alternative restaurants. And, in the end, the real negativity is coming from sources outside the industry. The first real negativity came about a dozen years ago now from a strange source, in the form of Ross Klein, a university professor in social work from Newfoundland. Just how many in this Canadian province of 515,000 actually take a cruise each year we don’t know, but Klein is not a Newfoundlander. Although he had arrived in Newfoundland before he started his criticism of the industry, he had held junior teaching positions at Yeshiva University in New York, Syracuse University, Iowa State, State University of New York and Skidmore College before he became a professor at Memorial University in St John’s. And he has degrees from Arizona State University, the University of Maryland and Syracuse University. Not long after arriving in Newfoundland, Klein started making a reputation for himself. In quick succession, he published four tomes on cruising. The man has made a veritable industry out of making money from books that criticize the cruising industry and in getting himself hired as some sort of “expert,” especially at hearings convened by one Senator Rockefeller. Indeed, Klein has made himself into such a celebrity that he maintains his own website at www.cruisejunkie.com, where one can find just about anything critical of the cruise industry. One of his speaking engagements biographies says, “as an outspoken critic of the industry, Klein’s is a unique voice,” but one must wonder why it is so unique. While sensational, Garin’s book carries a good story about the mergers and acquisitions activities of these lines. Washington-based Garin, now an investment banker, also co-authored the New York Times bestseller “Win Forever: Live, Work and Play Like a Champion” in 2010 with Seattle Seahawks head coach Pete Carroll. But having written his first tome on cruising, although he has also written occasionally for Conde Nast Traveler, he does not seem to have returned to the cruising theme. To its credit, Garin’s “Devils on the Deep Blue Sea” makes a very good read if you’re interested in boardroom shenanigans at the cruise lines during their various takeover attempts. And rather than lecturing in social work, Garin actually served as a petty officer in the Royal Norwegian Navy between 1997 and 1999. Another frequent source of negative comment on the North American cruise industry is Walker & O’Neill, a firm of Miami lawyers who make their crust making claims against cruise lines on behalf of passengers and cruise ship crew members. Jim Walker even runs a website called “Cruise Law News” and is often to be seen being interviewed on US television. But one can hardly hold it against a lawyer that he tried to make a name for himself in order to maximize his fee billings. More recently, in January of this year, came a company called Un-Cruise Adventures, really an amalgam of two previous lines called American Safari Cruises and InnerSea Discoveries. But this renaming was really aimed at conveying the line’s unique style of exploration cruising. And they were not the first to use this theme. SeaDream Yacht Club had started using the tagline “it’s yachting not cruising” almost a decade before. These are hardly naysayers, however, but companies with products that they want to differentiate from mass market cruising. Despite all this negativity that comes from only a couple of individuals, cruising is still an industry that is growing from strength to strength, mainly now in Europe and Asia. One can only hope that once Europe pulls into its full stride and becomes a mature market, we will not have naysayers like Senator Rockefeller and Ross Klein running their own sort of circus. Neither has ever worked in the industry and it is actually rather unsightly, even to some fellow senators, to see the two of them gang up together in senate hearing after senate hearing. 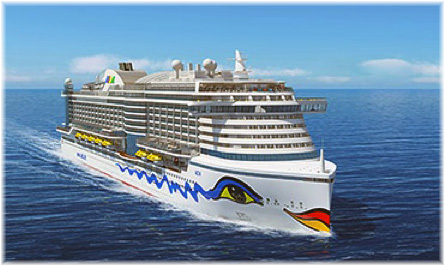 Mitsubishi Heavy Industries Ltd. (MHI) has begun construction at its Nagasaki Shipyard of the first of two new-generation 124,500-ton cruise ships for AIDA Cruises, the German arm of Carnival Corp & plc. The two new ships, which will incorporate an array of new environmental technologies, are scheduled for delivery in March 2015 and March 2016. The keel-laying ceremony to mark the occasion was recently attended by owner’s representatives including Pier Luigi Foschi, chairman of Costa Group, Michael Thamm, CEO of the Costa Group, Michael Ungerer, president of AIDA Cruises; and chairman Hideaki Omiya from MHI. The new ship will be the first of two vessels ordered by AIDA, each able to carry around 3,300 passengers capacity– and the largest ships ever for AIDA Cruises. The order for the two follows the two highly successful 116,000-ton ships, Diamond Princess and Sapphire Princess, built for Princess Cruises in 2004. The new ships will incorporate all the various features to enable provision of AIDA’s unique style of cruising experience. Among the features already selected for installation is MHI’s proprietary technology to reduce fuel consumption and carbon dioxide (CO2) emissions through use of a layer of air bubbles along the vessel’s bottom. This is expected to reduce fuel consumption by about 7%. From the outside, however, the most interesting point is that the ship is introducing an entirely new form of bow for cruise ships. Instead of the usual clipper-style bow, it will consist of a form of inverted X-bow now common in new offshore vessels. The new bow is more efficient and provides seakeeping abilities equal or greater than a traditional bow. It will also cause less stress and wear on the vessel as it slices through heavy seas instead of trying to part them and push them aside.